Ask, and it will be given you; seek, and you will find; knock, and the door will be opened to you (Mt 7:7). Most people think miracles only happen in movies or the Bible and their prayer lives reflect this belief as well. 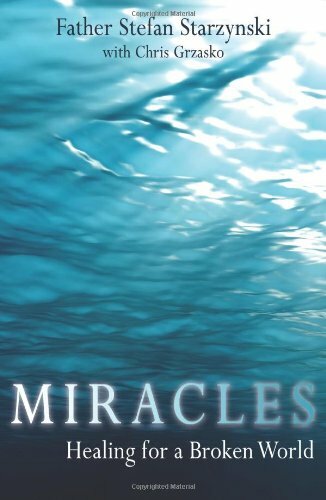 Author Father Stefan Starzynski reminds us, through his personal experience and real stories, that God is ever present, and that miracles are among the gifts offered to those who petition Him in faith. Father Starzynski's life is an account of God's ability to use imperfect human instruments like him and you to carry out His will. Father Starzynski recounts numerous episodes when he personally experienced miracles, often in totally unexpected places. His riveting stories of tiny infants facing life-threatening medical conditions, of people battling demons and disease, of his own experience overcoming depression, and much more, will inspire, instruct, and provide hope for all. Experience the miraculous testimonies from over twenty individuals and families whose lives have been touched by God through Father Starzynski's ministry, as well as helpful appendices on topics like Medjugorje, St. Therese, and a section of prayers. Author royalties from the sales of Miracles: Healing for a Broken World will be donated to the Paul Stefan Home for Expectant Mothers paulstefanhome.org. Miracles abound in this heartfelt book. Father Stefan Starzynski takes you on a tour of miracles, big and small, and illustrates how to find them in your own life. --- Raymond Arroyo, New York Times bestselling author of Mother Angelica: The Remarkable Story of a Nun, Her Nerve, and a Network of Miracles, and host of EWTN's The World Over. A priest in the Diocese of Arlington, Virginia, Father Stefan Starzynski informally began his healing ministry on the day of his ordination. Widely known for his healing Masses, he is also a retreat leader and Cursillo chaplain. An advocate for the unborn, he is the founding member of the Paul Stefan Foundation, an organization that aids women in crisis pregnancies.